Over 30 years ago a TV appearance first highlighted, somewhat humorously, how a farmer could feed six calves at a time using two JFC Multi-Buckets. But now, almost in agri-science fiction style, the firm have launched a revolutionary automated Calf Feeder which can feed over 140 calves without using a bucket. At a time when it is difficult and expensive for farmers to get workers, this automated Feeder can be programmed by one person to feed 140 calves. A micro-chip on the calf’s ear ensures that each calf gets the correct amount of milk every time and if they don’t the Feeder informs the operator. It has taken almost three years of painstaking research and development plus countless trials on many farms for the R&D team at JFC in Tuam to perfect their labour-saving device which they now launch on the Irish market. The research and year-long farm trials involved many sleepless nights and long days monitoring the feeding habits of calves according to John Concannon and his son, Damian a member of the R&D team at the firm’s Tuam headquarters. He says that the R&D team have been extremely dedicated and spared no energy or efforts in perfecting this product through the most rigorous of trials. 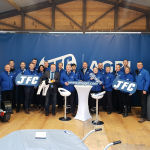 So confident is the JFC Group of having come up with a world class product that they have created a separate factory for the Evolution’s manufacture at their Tuam headquarters. An extension to the existing factory involved expansion into what was the adjoining former HomeLee Bedding plant. It has been completely refurbished and fitted with new specialist manufacturing and assembly lines. Each Evolution goes through a rigorous quality assurance test on a computerised calf-feeding simulator before leaving the factory. “It’s a good news story for Tuam and a major technological leap for an Irish firm to be manufacturing an automated Calf Feeder as sophisticated, yet as easy for one person to operate as this one. We are ready to launch this product internationally” says John Concannon, Chairman and Managing Director of the JFC Group. The Evolution Calf Feeder provides 24/7 feeding for the farmer. “The Control Unit has a computer interface which reads the calf’s tag and mixes the milk powder at the correct temperature. It is connected to 4 Feed Stations where the calves drink the amount allocated to each of them and then move away to allow the others to do likewise” explains Damian Concannon. His father John says that “the ear tags are made locally by Cormac Tagging in Tuam and if a calf doesn’t drink his allocated amount of milk the Feeder alerts the farmer to check if the animal may be suffering from a health issue”. “It also leads to quieter more contented calves as they get accustomed to queuing up for their milk and there is no rush towards buckets or spilling milk as only one calf at a time can fit into each Feed Station. When the calf has got it’s fill it just backs out and the next calf moves in” says John. Damian says “if the farmer notices that one of his/her calves is not thriving as well as the others he/she can programme the Feeder to target an increase in the amount of milk for that animal. It is as simple as putting that calf on a different Feed Curve which will allow the animal to get more milk so that it can catch up with the rest of the calves. The Evolution can feed four calves at the same time in the different Feed Stations and with varying amounts of milk for each one if required”. “Dual-hoppers allow for two different types of calf milk replacer to be used eg. a farmer can use a high-protein milk to get young heifers weaned and breeding as quickly as possible with a more cost-efficient milk specific for male calves destined for the beef herd” added Damian. This feature in conjunction with the 7 Feed Curve options makes the Evolution Calf Feeder one of the most versatile on the market. “Versatility is important to ensure calves of varying age, breed and health are all catered for and that farmers specific rearing objectives are met” says Damian. John Concannon commented that the last few years of research and development has been costly but it is now rewarding to know that JFC have achieved perfection with the product which is the only one of its type manufactured in Ireland. “Enterprise Ireland has supported us in the development of this product and there are a lot of advantages with this automated Feeder compared to old way of feeding calves, even with our famous JFC Multi-Buckets,” says John. “This is a cost-effective and time saving way of feeding calves with such accuracy that you can trace what every calf is getting. The Evolution will be used by a lot of beef as well as dairy farmers and it is fully grant aided. We hope to have at least 100 of them manufactured and sold both here and in the UK between now and the end of the year,” added John. The Evolution is a self-cleaning Feeder which carries out a cleaning cycle twice daily. “It feeds the calves and then does the washing-up” says Damian. It is a money-saving and time-saving device that feeds at a consistent volume and temperature thus producing better quality and more evenly finished cattle for the ever-changing and technologically advancing Agri sector. 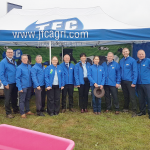 “Plastic is our forte at JFC and our R&D team have come up with a hygienic automated Calf Feeder which is a massive leap for us from when we developed the JFC Multi-Bucket which caused a lotta’ laughs on TV a long time ago,” concluded John Concannon with a laugh. JFC launch the Evolution Calf Feeder in Ireland at the National Ploughing Championship on Tuesday, 18th September.